The Montessori classroom is equipped with all the materials necessary for a child to teach him/herself reading and math. 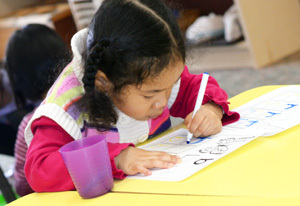 The primary focus of the Montessori Method is preparing the child for the development of independent, individualized learning; however, early development of academic skills is usually the by-product of the prepared environment. Montessori children learn to read through phonics. Children learn the "sounds" of the alphabet. After the child masters some basic sounds, she begins to learn the moveable alphabet. In this exercise the child lays out 4 or 5 pictures of objects. They are all 3 letter phonetic words (e.g. rat, man, cat). The child "builds" the words using letters from a tray. The child then turns the picture over and checks her work. She then write the words. The child brings her written work to a teacher who asks the child to read the words back to her. The latter is a definite second step and usually there is a time lapse between mastery of the two skills. card is used as a basis for self-correction. In this way the student begins sight-reading at the same time as developing a strong phonetic base. At some point between 3.5 and 5 years old, a child "bursts" into reading. At this point she no longer sounds out words but seems to almost intuitively use all of her pre-reading skills to decode the written page. At Acarath, this usually happens during a child's pre-kindergarten year. Almost all of the children at Acarath are able to read when they enter kindergarten and are reading "chapter" books before they enter first grade. The advantage of learning reading this way is twofold. First, the child has "discovered" reading and takes pride in his ability to learn. Second, the child develops a love of reading. She has not had to follow a lesson plan. The quicker learner is not bored waiting for other children to "catch up" while the slower learner is able to develop without the pressure of trying to "keep up." Montessori math materials are a reflection of the genius of Maria Montessori. These materials are so effective at teaching math concepts that they have not only remained unchanged in the Montessori environment but are replicated and copied in most traditional classrooms. Next the child learns to match the quantity to the symbol: "This is two **, this says 2 **. When the child is able to match quantity, name, and symbol for numbers 1-10, the teacher introduces number manipulation on a concrete level. At the same time, the golden bead material helps introduce base 10. This helps the child understand the concept of place value. It enables them to perform all math functions including "borrowing" and"carrying" on a concrete level. Thus the 3 and 4 year old is able to do math problems and demonstrate an understanding of "how numbers work" before she has memorized any "facts" or "tables." Each classroom contains all of the math materials at all times. If a child is puzzled by a concept that seems abstract, he can go to the manipulative and observe a concrete demonstration of that concept. That can be as simple as "exchanging" one ten bar for 10 units or as complicated as the binomial or trinomial cube. 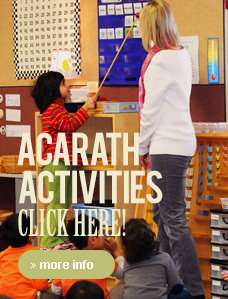 At Acarath the children are usually able to perform all four math functions using manipulatives and demonstrate an understanding of those functions in their pre-kindergarten year. In kindergarten they are usually able to demonstrate an understanding of basic geometry (the relationship of plane to solid, the names and properties of triangles, and the concept of measuring shapes) and are able to do word problems. At Acarath we have complete reading, science and math labs, language arts and spelling books, as well as history and geography exercises. Appropriate materials are available for any child to develop reading, writing, and math skills up to the 12th grade level. These materials are available to all the children, regardless of age. No child is prevented from progressing because of a preset curriculum or lesson plan. It is the teacher's role to determine each individual child's academic level and offer them the opportunity to challenge themselves to the utmost of their ability. Stop in for a Tour. We have an open door policy. No appointment necessary between the hours of 8:30am and 5:15pm. Click the registration link above and choose a program. Submit completed forms with deposit. Your child will either be accepted immediately or placed on a waiting list.